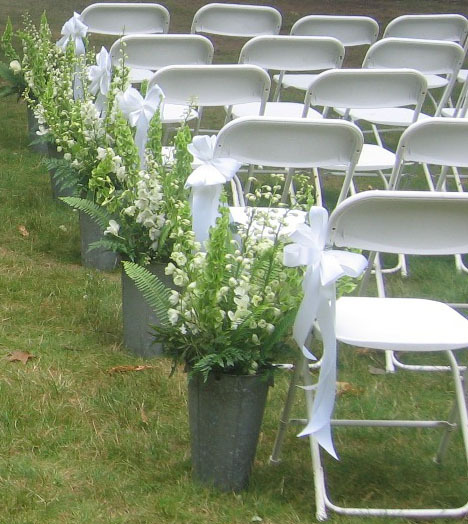 Buckets of fresh ferns and white flowers to softly welcome your family and friends. Add bunches of ruffly green Bells of Ireland , white Foxglove and fragrant white Lilly of the valley for subtle impact. Lily of the valley also adds that extra touch cheerfulness and lifts our spirits. It is a joy each spring to happen upon a new spot of Lily of the valleys tidily tucked away in the shade. I usually catch a drift of their scent first which sends me on delightful search under the Hosta leaves. Or maybe the invisible fairies dancing in the ferns lead me to them? This was written by admin. Posted on Friday, May 29, 2009, at 3:59 pm. Filed under Decorations. Tagged Flowers. Bookmark the permalink. Follow comments here with the RSS feed. Post a comment or leave a trackback.